• Almost no training required � ROSS was built from day one to take the mundane work off your sales rep so that they can do what really makes you money, SELL! You no longer need to hire computer savvy sales reps or spend days training them how to use your system. 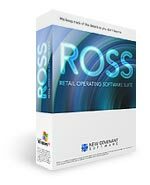 • Easiest in the industry to use � ROSS walks your sales reps step by step through every sale. For an accessory, the full transaction can be performed in under a minute and a phone sale can be performed in about two. • Streamlined � Start by scanning any barcode (ESN, IMEI, SIM, UPC, Accessory UPC, SKU or even Receipt) and the system will automatically know what actions you may want to perform. Direct Fulfillment? No problem One simple button and you are moving!